Monet’s Waterloo Bridge: Vision and Process brings together nine stellar versions of Claude Monet’s well-known series of paintings depicting London’s Waterloo Bridge. 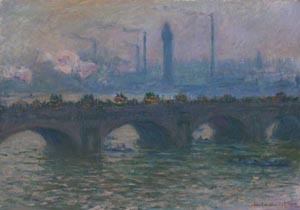 These paintings, which include WAM’s own 1903 version of the iconic London landmark, reveal the breadth of Monet’s emphasis on color, light, and density. Monet’s later paintings often relied on the concept of seriality, sometimes resulting in dozens of variations of the same subject. His Waterloo Bridge series presents an ensemble that, collectively, expresses the essential qualities Monet found inherent to the River Thames’ fog-bound landscape. The exhibition gives viewers a rare opportunity to view an exceptional grouping of Monet’s paintings — made possible through loans from museum collections across the United States — and to examine closely the Impressionist’s artistic process.